I’m seeing a lot of problems with Apple’s 10.11.3 update. If you’ve already installed the 10.11.3 update and everything seems fine, consider yourself lucky; if you haven’t installed it, play it safe and don’t install it. I’ve never seen a more problematic update. UPDATE: the 10.11.4 update is out and I’ve seen zero problems with it. Read “Should I Update My Mac to 10.11.4” for more info. UPDATE #2: now we’re at 10.11.5. It too has no problems. See my article about how to install 10.11.5 the pro way. You’re probably wondering what’s so bad about the 10.11.3 update. Well, nothing— unless you’d call a Mac that won’t start something to be concerned about! 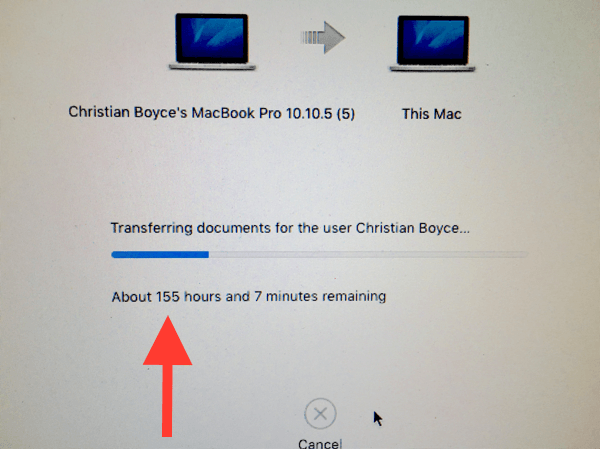 When things go wrong with 10.11.3, they go wrong very quietly– the update appears to install, and then the Mac restarts, which is totally normal— but then it doesn’t finish restarting. It gets about 75% of the way through the startup and stops. Turning the Mac off and on again doesn’t help. Repairing the disk after starting from the Recovery Disk sometimes helps; reinstalling the system sometimes helps; waiting a really long time sometimes helps. In my case, I had to reinstall the system, and then delete my own user from the system, and then restore my user from a Time Machine backup. It took a long time. See below. Combo Updates include everything needed to take you from the base system to the current version. In this case, it means it has everything needed to take you from 10.11.0 to 10.11.3. 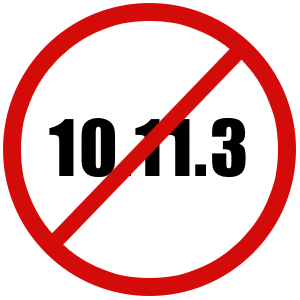 The automatic update only contains what’s necessary to go from 10.11.2 to 10.11.3. Installing stuff that you already have (such as the stuff that got you to 10.11.0 to 10.11.2) might seem like a waste of time but in my experience, it never makes things worse. In a way, with Combo Updates you’re refreshing the system, and that’s good. Combo Updates are always available but never via the automatic Software Update mechanism. Instead, you have to search for them on Apple’s site. I’ve done the work for you here— use my Big Blue Button. Personally, in the case of 10.11.3 I wouldn’t even do the Combo Update. I’d wait for 10.11.4. In addition to my own misadventure with it, I’ve seen three Macs with the same won’t-start-all-the-way symptom, and I’ve read about another one (Adam Engst’s, he of the TidBITS newsletter fame). That’s more trouble than I’ve seen for any Apple update in 25 years of helping people with their Macs. Do yourself a favor and steer clear of the 10.11.3 update. Do your friends a favor and tell them to steer clear too. Do it the easy way with the sharing buttons below. Thanks Christian; Michel forwarded this to me. BTW, are you taking on new customers? Michel complains ever time she looks at my screen & pleads with me to use your services. Sadly we had already downloaded. Now we no longer see the top bar or dock when on Safari. Have tried everything. Thoughts? Hit Escape key when in Safari to bring back the menubar. The Dock will probably come back too. You’ve gotten into Full Screen Mode, which sounds good but isn’t for me. It’s triggered by clicking the green button in the window’s title bar. You could get out of Full Screen Mode by moving the mouse to the very very top edge of the screen, which will make the menubar re-appear… and then you could click on the green button again to get back to normal. I don’t like the way the green button works. I don’t want to go to “Full Screen Mode.” I just want to make the window bigger. I’ve found “Moom” to be the answer for that. Get it from the Mac App Store: https://itunes.apple.com/us/app/moom/id419330170?mt=12&at=10lLkg. Watch the demo movie here: http://manytricks.com/moom/ (the video introduction is on the right, part-way down). You can also try holding the Option key down when you click the green button. That makes the button work like it used to work. The option key suggestion worked. Thanks! Tried multiple apple help websites. Should have gone to christianboyce.com first!